Nimue and I used to joke that we keep our 1992 Ford Aerostar just to carry our tandem to remote ride starts. At some point the humor turned to truth. 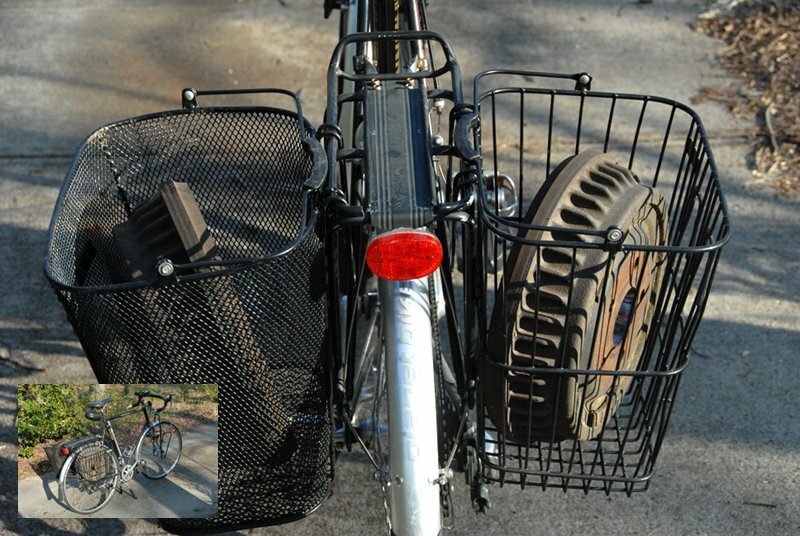 The tandemobile also hauls large or numerous objects when we need to do so. Otherwise it doesn’t see much use. A couple years ago, the rear brakes objected to the neglect; they’d rather get regular exercise. The springs wouldn’t withdraw the pads after we let up on the brake pedal. It didn’t sound good, in neither way we mean that. Our local auto repair shop quoted quite a sum to replace springs, pads, drums, and wheel cylinders. I thought their diagnosis was correct and the price fair; they had to cost in the possibility of warranty service and potential liability. Nevertheless, I decided to save a few hundred dollars and do it myself. Before I finished I reviewed all the reasons I don’t work on our cars much anymore: a concrete driveway is a hard, cold surface after the first hour or so; twenty-year-old fasteners long to remain fast; a dropped nut is hard to find when it’s bounced into the fallen leaves that carpet our yard. But I fumbled along and was rewarded with perfectly working brakes … and left with old brake drums. Which, hung from a wire and struck with a mallet, make a good gong. Or which can stand in for an anvil for small metal-working projects. Having need for neither, I saved them for a friend who welcomed material he could recycle and sell for scrap at the same time. This next part is a little embarrassing—Andrew is so green that I hated to drive to his home to drop them off. I felt I should carry them by bicycle, as Andrew would. Brake drums are a bit more weighty than groceries, though, and it was an errand easy to put off till tomorrow, or next week, or the week after, especially in winter. Then Andrew moved to Arizona for a couple years to study sustainability. I am not going to save the drums against his return. To the steel recycling bin at the landfill they shall go! And our weather’s finally turned so pleasant that I just might, in Andrew’s honor, carry them there by bike. Slowjourner Truth wonders if this load makes his rear look fat. Comments welcome … have you kept something for someone else perhaps past the point you should? 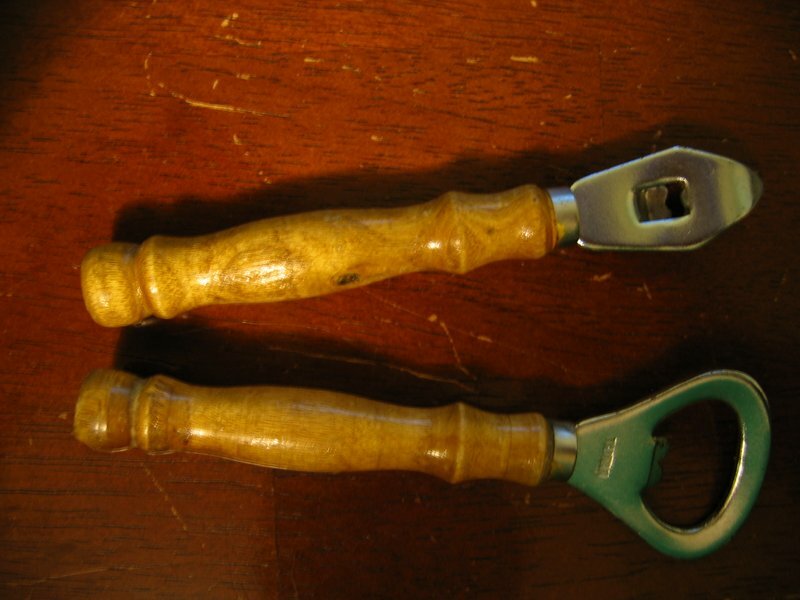 Some food and drink comes in bottles and cans, and since we don’t want to break our teeth, we have tools to get inside, like these two openers with turned wooden handles. They work well, but I noticed this evening that we have another opener, of the kind stamped from a blank of steel, that has a crown cap bottle opener on one end and a can piercer on the other. It alone can do what these two separately accomplish, so they’re redundant and can go. These are more romantic than the PBR church key that’s beat them out for the job, but they are plural while it is singular. Comments welcome … do you have extras where you need only one? I’m going to look for more examples of that among our stuff. Nimue said, “I have a shed for today. Remember that cream-colored towel embroidered with a white poinsettia we got once upon a time?” I did, though only because I’d glimpsed it in the bottom of the box she’s been sorting through. “We aren’t people who’ll put out something too pretty to use,” Nimue judged. 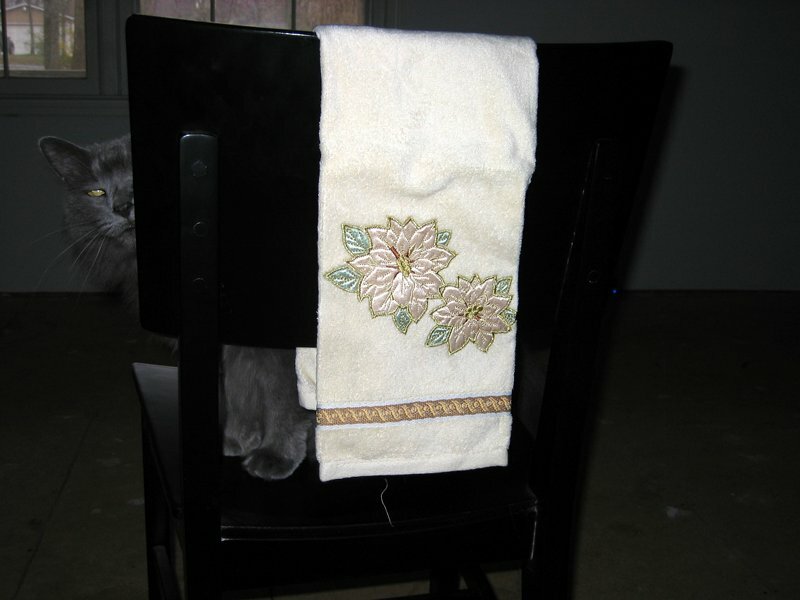 Blue couldn’t care less about the towel; she loves it when furniture moves for photo shoots. I love the greenery and glitter of holiday decorations, but she’s right. The towel should go to persons with the gift for comprehensively decking their halls, all the way to the washroom. Comments welcome … do you struggle with any stuff that’s “too nice”? This is What I shed today’s 100th post. (Hooray!) I’d like for it to be memorable, but I’m finding it hard to pick something singular for the daily shed. It was more a little of this, some of that. I backed up the files on the old BlackBerry and executed a secure delete, sorted two boxes of mobile phone paraphernalia, finished choosing which boxers are too worn to wear anymore, and did some other catching up I could claim if I wanted to stretch the point. I’m still trying to get my thoughts together about Tiny, but they need more time to gambol in the pastures of my mind. Maybe tomorrow they’ll come when called. Comments welcome … today, did you take a few steps or travel many miles toward your goals? 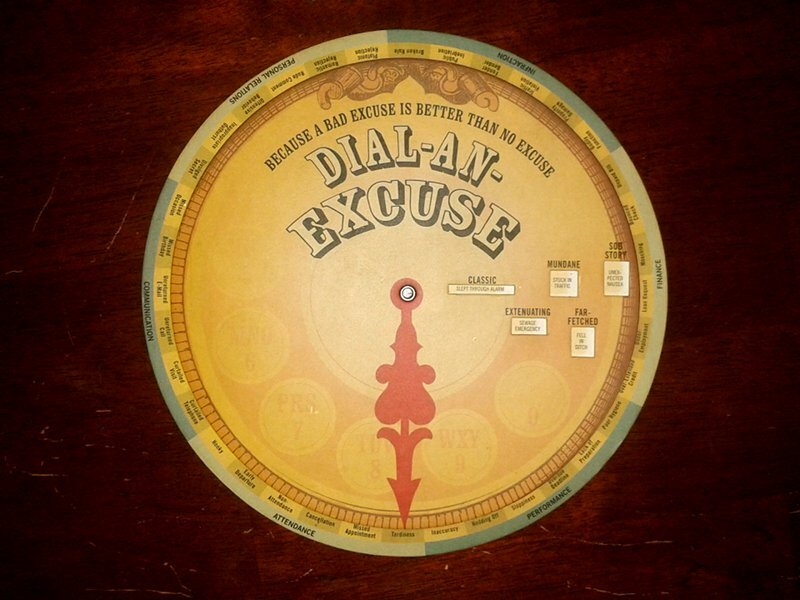 While I’m on the subject of shedding items that previous occupants unburdened themselves of by leaving them behind, we’ve enjoyed our amusement from the “Dial-an-Excuse” wheel and are ready to pass it along. Several years ago Nimue found it in an office she moved into. It’s the sort of gag gift one laughs at once or twice and then urges onto a friend … except it’s also the kind of trivial fluff Nimue and I lose track of among the thousand other bits we wish to responsibly dispose of. Perhaps I could use it to dial up an excuse the next time I’m late completing my daily shed and WIST post. (For the record, it tells me my “extenuating” excuse tonight is a “sewage emergency.” In fact, we once survived one of those in a rented home’s wet basement.) But no, it’s better to put it in the box bound for the thrift store. Let it prompt someone else to laugh at humanity’s collective frailty. Knowing myself, that’s something I already know how to do. Comments welcome … got a favorite excuse you’re ready to ridicule? Care to venture a guess what this is? 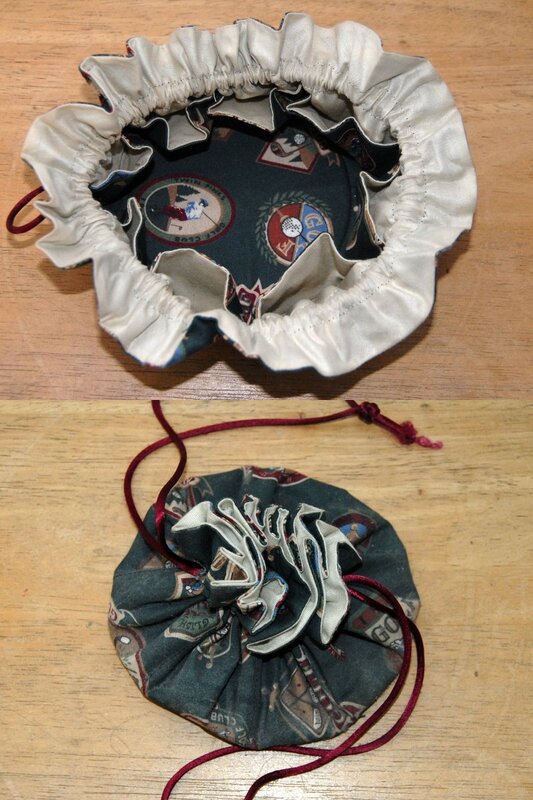 We neither know what it is nor can imagine its intended use (well, we can imagine some … like a clever organizer for bottles of nail polish with space in the middle for a hockey puck). But since we’ve failed to imagine any we’d put it to, we’ll put it in the box destined for the Goodwill Industries collection. Comments welcome … what odd clutter have you inherited that you’d just as soon shed? I love tech. Oh, not all of it, certainly. Granting a patent for the electroluminescent animated billboard should have been followed immediately by outlawing it for offenses against nature. But a lot of tech holds out the promise that the information age can be a lot greener than the industrial revolution and its reign … though it’s up to those who use it to make certain the promise is kept. And so, though we love tech, Nimue and I mostly position our purchases at the dull edge. We buy what’s proven, after the bugs have been found and squashed and the price is coming down. Then we keep it for as long as it still does the job. I don’t want to brag, but I will testify: on my desk at the church office a ten-year-old Dell desktop computer running Lubuntu cheerfully does everything I ask it to do. I used my second mobile phone for eight years. Our BlackBerrys, sorry to report, lasted only half that. Oh, they still work, in the sense they can receive and place phone calls. But a day came when my smartphone turned into a handful of only average intelligence. 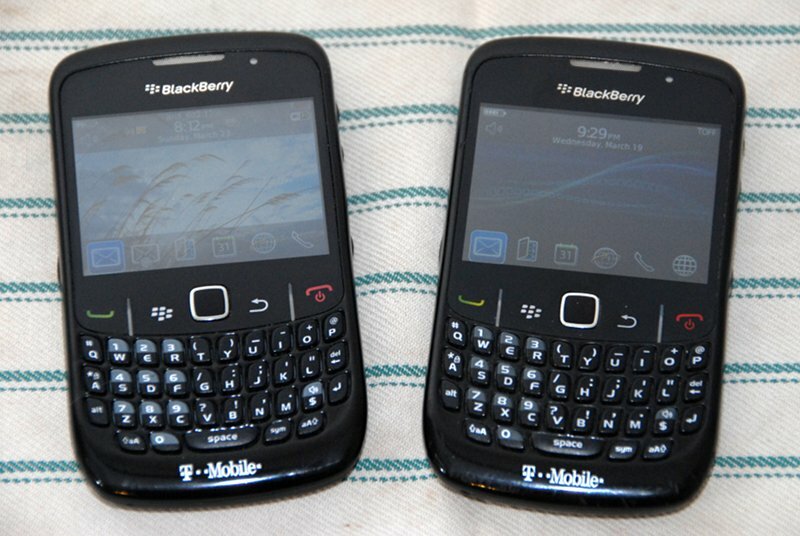 Research in Motion lost so much market share that Google turned off its BlackBerry mobile apps. I’ve put up with the lack for two years, but no more. I want my calendar in my pocket again. Nimue agreed that we shouldn’t continue to pay a monthly premium for BlackBerry’s back-end data services, so she’s upgrading too. Comments welcome … when has “still working” tech stopped working for you? Some nights that’s shed enough. Comments welcome … when do you just need to go to bed?